"We warned at the start of ZetaTalk, in 1995, that unpredictable weather extremes, switching about from drought to deluge, would occur and increase on a lineal basis up until the pole shift. Where this occurred steadily, it has only recently become undeniable. ZetaTalk, and only ZetaTalk, warned of these weather changes, at that early date. Our early warnings spoke to the issue of global heating from the core outward, hardly Global Warming, a surface or atmospheric issue, but caused by consternation in the core. Affected by the approach of Planet X, which was by then starting to zoom rapidly toward the inner solar system for its periodic passage, the core was churning, melting the permafrost and glaciers and riling up volcanoes. When the passage did not occur as expected in 2003 because Planet X had stalled in the inner solar system, we explained the increasing weather irregularities in the context of the global wobble that had ensued - weather wobbles where the Earth is suddenly forced under air masses, churning them. This evolved by 2005 into a looping jet stream, loops breaking away and turning like a tornado to affect the air masses underneath. Meanwhile, on Planet Earth, droughts had become more intractable and deluges positively frightening, temperature swings bringing snow in summer in the tropics and searing heat in Artic regions, with the violence of storms increasing in number and ferocity." 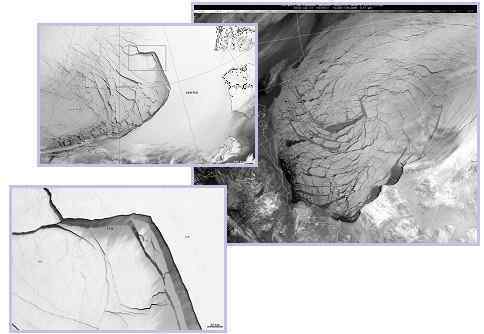 Would the Zetas be able to let us know what is causing the early break-up of the Arctic Ice, the ice seems to have taken on a swirling pattern at the same time, would this be wobble related? [and from another] http://www.vancouversun.com/news/national/Canada+Arctic+cracks+spec... The ice in Canada’s western Arctic ripped open in a massive “fracturing event” this spring that spread like a wave across 1,000 kilometres of the Beaufort Sea. Huge leads of water – some more than 500 kilometres long and as much as 70 kilometres across – opened up from Alaska to Canada’s Arctic islands as the massive ice sheet cracked as it was pushed around by strong winds and currents. It took just seven days for the fractures to progress across the entire area from west to east. [and from another] http://earthobservatory.nasa.gov/IOTD/view.php?id=80752&src=iot... A high-pressure weather system was parked over the region, producing warmer temperatures and winds that flowed in a southwesterly direction. That fueled the Beaufort Gyre, a wind-driven ocean current that flows clockwise. The gyre was the key force pulling pieces of ice west past Point Barrow, the northern nub of Alaska that protrudes into the Beaufort Sea. The Figure 8 formed by the N Pole during the daily Earth wobble has shifted somewhat to the East, due to Planet X positioned more to the right of the Earth during its approach. This was anticipated, and well described in ZetaTalk, the Earth crowding to the left in the cup to escape the approach of Planet X, so the angle between these two planets would change slightly. This shift of the Figure 8 to the East is due to the push against the Earth’s magnetic N Pole occurring sooner each day than prior. Thus instead of occurring when the Sun is high over the Pacific, over New Zealand, it is now occurring when the Sun is high over Alaska. All the wobble points have shifted eastward accordingly. This has brought a lingering Winter to the western US, and a changed sloshing pattern to the Arctic waters. Instead of Pacific waters being pushed through the Bering Straits into the Arctic when the polar push occurs, the wobble is swinging the Arctic to the right, and then later to the left, creating a circular motion in the waters trapped in the Arctic. Since the Earth rotates counterclockwise, the motion also takes this path. This is yet another piece of evidence that the establishment is hard pressed to explain. They are attempting to ascribe this to high pressure and wind, all of which are not new to the Arctic, but this circular early breakup of ice in the Arctic is new. 13 people have been killed and 100 others have been injured following a heavy rain and hail storm in Buyende district, Uganda. The unusual weather ravaged the villages of Kabugudo, Nabweyo, and Nakabembe between 8:00 pm and 10:30pm on Sunday, April 21, 2019. Most of the deceased were swept away by floods into nearby swamps where they drowned. The storm swept away 300 homes and residents have found refuge at Kidera health centre IV. Survivors were transferred either to Kidera health centre IV or Kamuli general hospital respectively. A victim explains she decided to lock herself in her house. However, in no time, she saw her rooftop shaking and on her way out, it felt on her head. The UK has been hit by nearly a hundred large wildfires in 2019, making it the worst year on record already. Researchers told New Scientist that the figures, collated by the European Forest Fire Information System, were evidence that climate change had already heightened the risk of wildfires in the UK. More than 100 firefighters battled wildfires over the Easter weekend across Illkley Moor and Marsden Moor in West Yorkshire. Another fire broke out on moorland near Marsden on Tuesday afternoon, requiring ten fire engines to attend. There were also wildfires in Cornwall, Dorset, Derbyshire, Northern Ireland, the Peak District, Rotherham, Wiltshire and Wales, according to the National Fire Chiefs Council (NFCC). Scotland was affected by fires across the Highlands, including a large one that posed a “serious risk” to the Moray windfarm. The big change he has observed is that the wildfires are no longer confined to the traditional season of fires from late March to late September. “What seemed to happen last year and is happening this year, is we are not talking about a wildfire season – we are getting significant wildfires happening throughout the year,” says Hedley. The scale and duration of the wildfires was a huge stretch on fire and rescue service resources, Hedley adds. Spring is the point in the year when flammability peaks, with the most dead leaf and woody matter available to burn, says Thomas Smith of the London School of Economics, in the UK. “Both the fires in February and over this Easter weekend coincided with long warm dry periods with steady easterly winds – fire weather – and also with ignition risk from school holidays,” says Smith. Weather that is conducive to wildfires has become more likely in recent decades, with the average length of warm spells increasing from 5.3 to 13.2 days in recent years. “I would argue that those statistics suggest that we are already experiencing climate change and that it has already led to increasing wildfire risk,” Smith adds. He says the past two years have been the worst for UK wildfires that he can remember. The total area burned in 2019 so far is 17,199 hectares, almost on a par with the highs of 2018 and 2011, but with eight months of the year left to go. The rural nature of most UK wildfires means relatively little property is damaged compared to the multibillion-dollar cost of Californian wildfires. But they draw fire engines away from towns and cities, increasing fire risk there, and can cause health problems by causing pollution levels to rise, as happened in Greater Manchester last year. The following sequence of model maps in 6-hour intervals covers the interval from April 23 at 06h UTC to April 25 at 00h UTC. Note the ‘tongue’ of dust pushing across France into the British Isles and Ireland at the beginning of the interval extend into the northern Atlantic and reach Iceland by late on April 24 and then push further into the Strait of Denmark towards Greenland. Meanwhile dust pushes across central into eastern Europe as far as the Baltic states, Poland and Ukraine and as far north as southern Sweden. Large dust loads persist over the central Mediterranean: the southern coast of the Mediterranean in Tunisia, Libya and Egypt, across Malta and south Italy, into Greece and western Turkey. While Saharan dust events are not rare, particularly across the Mediterranean and southern Europe, the current one is very extensive and is producing major dust loads. The state’s southwest had more than a Good Friday, with residents waking up to record snowfall. As predicted in news.com.au’s weekend weather forecast, the Stirling Ranges have seen snow just in time for Easter — and for the first time in 49 years. While snow this time of year is extremely rare, the Stirling Ranges have broken April records this weekend with residents enjoying the earliest recorded snow event in a calendar year in the state’s history. The last recorded fall before this time was April 20, 1970, according to Bureau of Meteorology (BOM) records. And the frost could potentially spread across the Wheatbelt by Sunday morning. The unseasonal weather has seen Perth residents snow boarding in their yards and making their way to the 1099-metre tall bluffs to get their own snaps for social media. And those who couldn’t make the trek, anticipated the traffic if they tried. BOM forecaster Matt Boterhoven told the ABC snow was an extremely rare occurrence in April. Today’s snowfall on Bluff Knoll was the earliest ever recorded in WA. The previous record was April 20, 1970. The cold snap also saw Albany and the Great Southern hit by hail at 1pm on Friday. With temps predicted to peak at 13C and 18C over the next couple of days, locals can expect Friday’s cold front to stick around until Monday. DUBAI: Iran’s Supreme Leader Ayatollah Ali Khamenei has approved drawing up to US $2 billion (RM8.2 billion) from the country’s sovereign wealth fund for relief and reconstruction after devastating floods, state media reported today. Yesterday, Interior Minister Abdolreza Rahmani Fazli said the weeks of heavy rain across the country had caused an estimated US$2.5 billion in damage to roads, bridges, homes and farmland. Iran’s worst floods in 70 years had killed at least 76 people and forced more than 220,000 into emergency shelters, state media cited ministers as telling lawmakers. “Using the National Development Fund is authorised if no other sources are available,” Ayatollah Ali Khamenei said in a letter to President Hassan Rouhani read out today on state television. In Geneva, the International Federation of Red Cross and Red Crescent Societies said today an estimated two million people needed humanitarian assistance as a result of the floods. It had launched an international emergency appeal seeking 5.1 million Swiss francs to expand support by Iran’s Red Crescent to an additional 30,000 families — equivalent to about 150,000 people. From mid-March to April 2019, widespread flash flooding affected large parts of Iran, most severely in Golestan, Fars, Khuzestan, Lorestan, and other provinces. Iran has been hit by three major waves of rain and flooding over the course of two weeks which led to flooding in at least 26 of Iran's 31 provinces and at least 70 people died nationwide as of 6 April, according to the officials. The first wave of rain began on 17 March, leading to flooding in two northern provinces, Golestan and Mazandaran with the former province receiving as much as 70 percent of its average annual rainfall in single day. Several large dams have been overflowed, particularly in Khuzestan and Golestan, therefore many villages and several cities have been evacuated. About 1,900 cities and villages across country have been damaged by severe floods as well as hundreds of millions of dollars of damage to water and agriculture infrastructure. 78 roads were blocked and the reliability of 84 bridges was questioned. A total humanitarian crisis as many still await relief assistence on rooftops. 4500+ livestock dead, farms completely destroyed. BBC Videographer explains how problems could have been minimized had public been able to plan for this type of situation and not built homes and livelihoods near rivers and outlets. Not long ago 2019, one extreme to the other, Iran was experiencing drought of epic proportions. Water resources were in question all over the country. Spring and Winter blending together in US recently. KANSAS CITY, Mo. — Pack away the sidewalk tables and flip-flops; break out the boots and shovels. Nature was showing its fickle side on Wednesday, with blizzard conditions, heavy snow and frigid air pounding parts of the Rockies and the Plains, just a day after the weather was sunny and idyllic. Schools and highways were shut down, hundreds of flights were canceled, and some communities braced for floods. While the whipsawing forecasts drew groans, they did not come as much of a surprise to those familiar with springtime in the Plains and the Rockies. Ahead of the storm on Wednesday, Gov. Jared Polis activated the Colorado National Guard, and about 50 soldiers were prepared to respond to stranded drivers. State officials also shut down a highway in the eastern part of the state and part of a highway that cuts through the mountains, citing numerous accidents. “Reopening is up to Mother Nature,” the Colorado State Patrol said on Twitter. Even before the low-pressure system reached the Rockies, it wreaked havoc on the West Coast, knocking out power in Los Angeles and kicking up dust storms in Nevada, according to AccuWeather. Officials in states across the Midwest watched anxiously for weather dangers. Much of the region is still reeling from severe flooding brought on by storms and rising rivers last month. The floods inundated small towns and created a humanitarian crisis on the Pine Ridge Native American reservation, where tribe members found themselves trapped in their homes with little access to food. Officials in Hamburg, Iowa, worked quickly to add a temporary five-feet-tall levee to the town’s current levee system before the Missouri River crests by Sunday or Monday, as they expect. Floodwaters inundated much of the town of 1,100 people last month after heavy rain accumulated on frozen ground in the region. “We’ll build that levee and vigilantly watch throughout the night in case flood does come,” said Cathy Crain, the Hamburg mayor. More pressing than Hamburg’s weather, Ms. Crain said, was the snow and rain in cities to the north, such as Yankton, S.D. When precipitation hits those areas hard, it swells the Missouri River and flows down into Hamburg. Meteorologists predicted as much as two and a half feet of snow in parts of eastern South Dakota. Forecasters were hoping that the long-term effects of this storm would not be as severe as those that set off the flooding last month. A heavy snowfall takes time to melt and run off into rivers and streams, reducing the chance of flooding, meteorologists say, while heavy rain brings faster runoff and greater danger. Warmer temperatures in recent days have also thawed the ground, meaning it should better absorb moisture. Still, Gov. Kristi Noem of South Dakota ordered state offices closed on Wednesday. Schools also closed in Rapid City, S.D., where several inches of snow fell and the streets became icy. State officials closed a roughly 125-mile stretch of Interstate 29 on Wednesday, from Brookings to the North Dakota border. It was not all that unusual to have a heavy snowfall in Rapid City in April, said Domico Rodriguez, the general manager of Hotel Alex Johnson. But this was different, he said, because the two-degree wind chills sweeping through the city came just three days after he was out playing softball in 70-degree weather. “It’s disheartening,” he said, adding that it was difficult to believe the forecast. In downtown Minneapolis, where snow was falling at a brisk pace, Chameera Ekanayake spent his lunch break huddled beneath a small ledge, trying without much success to keep the flakes out of his hair. The snow was an unwelcome development in a weather-weary city. After a harsh winter, he said Minnesotans had “been sick of it for a while” and hopeful that the snow was done for the season. “We had some pretty good days in the last couple weeks and so were like, ‘Yeah, this is the end of it,’” said Mr. Ekanayake, 32, who works in local government. He said he planned to work from home on Thursday, when conditions were expected to worsen. In Denver, the storm canceled more than 700 flights into and out of the city, postponed baseball games and sent businesses into shelter mode. The turn in the weather had Mitchell Carroll, the general manager at a Denver restaurant called Illegal Pete’s, longing for the sunny skies last week that had helped put the restaurant far ahead of its sales totals from a year ago. Prospects were not looking good for Illegal Pete’s 130-seat patio this week. “You’re not really sure because Coloradans aren’t really fazed by weather,” Mr. Carroll said. “But if it’s a blizzard warning,” he added, they might stay in. *World Weather* Flash floods in Botanical gardens of Rio de Janeiro, Brazil last night, April 8. 189 mm of rainfall reported in 4h. SEOUL, South Korea - A giant forest fire swept across swathes of South Korea Friday, as authorities declared a rare national disaster, deploying 900 fire engines and tens of thousands of personnel to bring it under control. The fire broke out late Thursday alongside a road in the town of Goseong, in the far northeast of the country and only around 45 kilometers from the border with the nuclear-armed North.